Environment Canada has issued a frost advisory for much of southern and eastern Ontario on Oct. 15, warning producers to cover up plants in frost-prone areas. Temperatures are expected to fall to near or below zero for several hours and tender plants could experience a general freeze during the night. Environment Canada says that areas surrounding the Great Lakes are more likely to be spared by the frost thanks to the mild waters of the lakes. Temperatures in those areas are expected to hover above zero. Frost advisories have been issued for the following areas: Hamilton, Dunnville, Caledonia, Haldimand, Elgin, Niagara, Sarnia, Lambton, Simcoe, Delhi, Norfolk, and Windsor, Essex and Chatham-Kent areas. 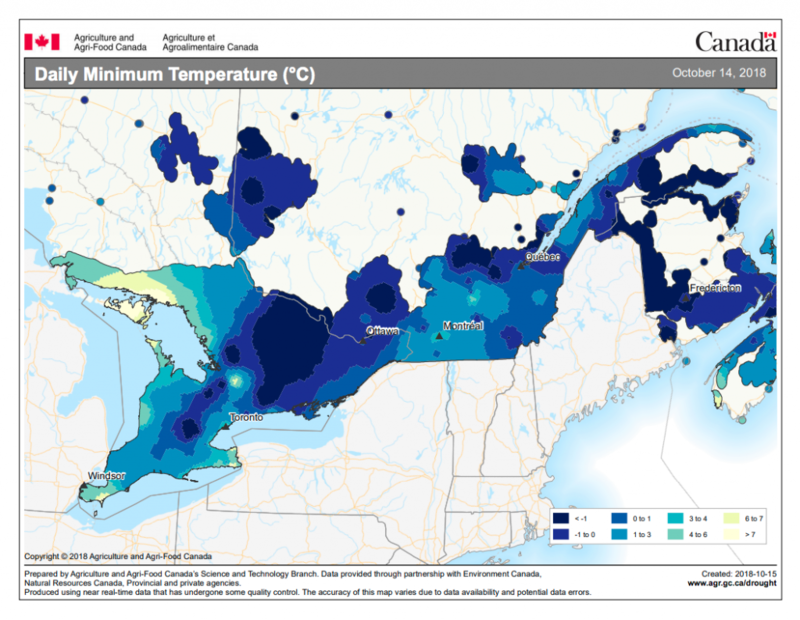 The Ontario Ministry of Agriculture, Food and Rural Affairs (OMAFRA) has frost resources for growers, and a resource on frost and hail damage in field crops specifically.